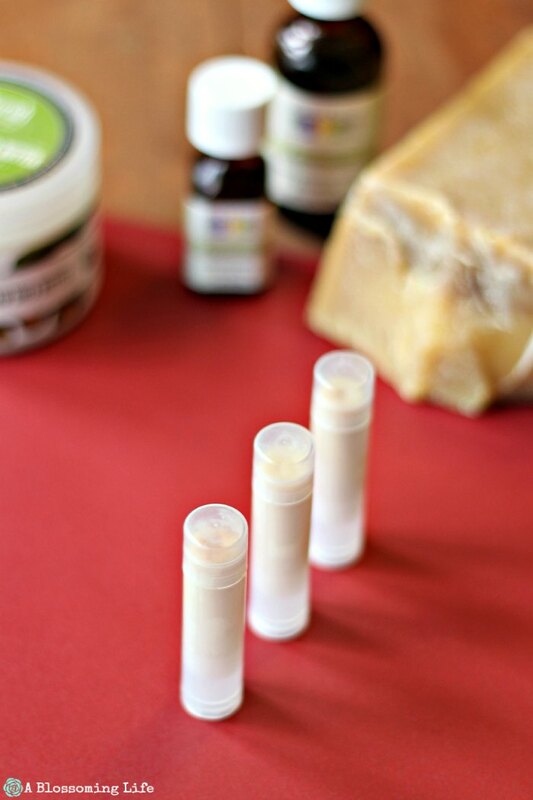 This easy DIY lip balm is a combination of nourishing shea butter and oils that creates a moisturizing lip balm, scented with lavender and peppermint essential oils. You lips will thank you. Follow my tips below when making this lip balm recipe. To make your own homemade lip balm, you will need: shea butter, coconut oil, beeswax, vitamin E, essential oils, and lip balm tubes. My favorite combination of scents right now, hands down, is lavender and peppermint . They’re both pretty good when by themselves, but when you put them together, they are amazing. The scent is so relaxing. When you are feeling overwhelmed, just take a big whiff of those two scents and you will instantly feel better. How obsessed am I with this scent combination? Recently, I have made lavender peppermint candles, hairspray, deodorant, and this lip balm! DIY Lip balm is a really easy homemade product that just seems more complicated than it actually is. The hardest part is actually ordering the lip balm tubes. 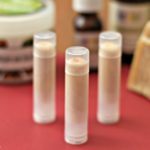 Usually, I like to make a batch of this homemade lip balm and then enjoy them all year long, plus give them as Christmas gifts. Of course, when you make your own natural products, you get to decide what goes in and the exact ingredients used. 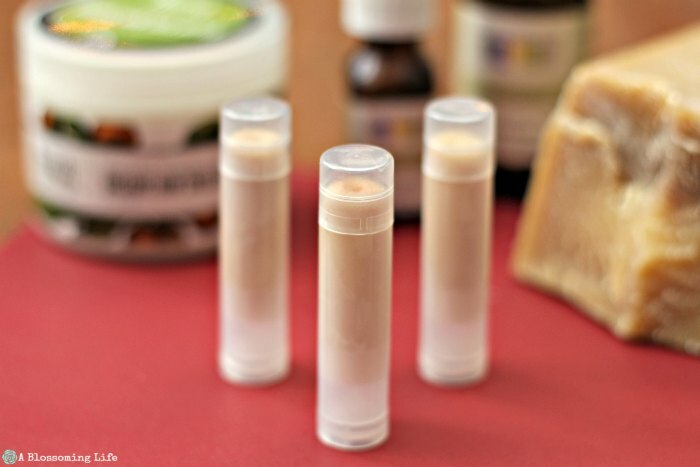 So no fake fragrances or chemicals in these all-natural DIY lip balms. Just healthy ingredients for healthy lips. Use a medicine syringe to put the melted lip balm mixture into the lip balm tubes. The easiest way to melt the oils is in a small sauce crock pot. Or you can make a double boiler by placing all the ingredients in a mason jar, and then placing the jar in a saucepan with an inch or so of water over medium heat. Add whatever essential oils you like, peppermint and lavender just happen to be my favorite combo at the moment. In a double boiler or very small sauce crock pot, melt beeswax, shea butter, and coconut oil, and wait a few minutes until everything melts. Once the ingredients have melted, turn heat off and mix in 1 tsp vitamin e oil and your chosen essential oil(s). Place in tins or empty lip balm tubes (I like to use a medicine syringe to fill my lip balm containers) and let cool on the counter. I know it might be hard, but wait to use until completely cooled. 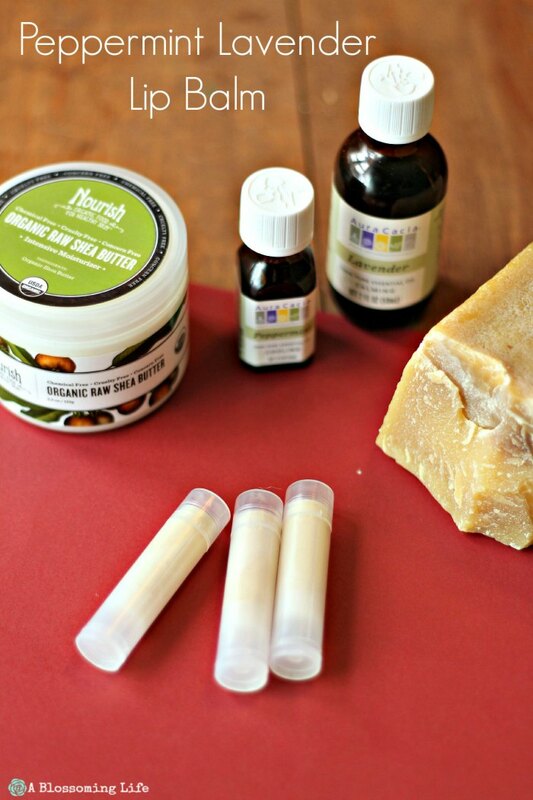 Want more DIY Products and Natural Living Tips? Check these out! New to essential oils? 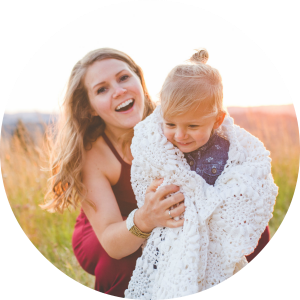 Learn How To Use Essential Oils here. Homemade Dry Shampoo is a staple in my house. Homemade Boo Boo Cream is a natural cream for cuts and bumps. Safe for kids. In a double boiler or very small sauce crockpot, melt beeswax, shea butter, and coconut oil, and wait a few minutes until everything melts. Once the ingredients have melted, turn heat off and mix in 1 tsp vitamin e oil and essential oil. Place in tins or empty lip balm tubes (I like to use a medicine syringe) and let cool on the counter. I know it might be hard, but wait to use until completely cooled! Enjoy! Wasn’t that easy? These would make great little gifts! Nothing is better than DIY gifts you can actually use.